Presented in an easy to understand format with numerous photos, drawings and descriptions. Suitable for the home mechanic and professional technician. 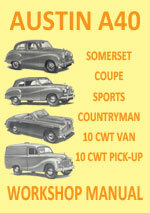 Austin A40 Somerset, Coupe, Sports, Countryman, 10 CWT, Van Workshop Service Repair Manual $8.99 Immediate Download!